With cable-related failures accounting for up to 80% of offshore wind project insurance claims, the rig enables the innovative testing of offshore array and subsea cables to improve their efficiency and resilience, supporting the development of next generation wind farms and associated electrical infrastructure. 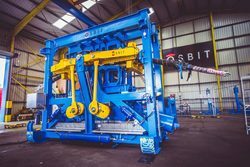 Brendon Hayward, Managing Director of Osbit, said “We are pleased to deliver a bespoke testing system to support ORE Catapult in advancing the global development of subsea cables. This project is a great case study showing how we employ our risk-mitigating programme delivery system to develop appropriately engineered solutions, fully aligned with our client’s requirements.